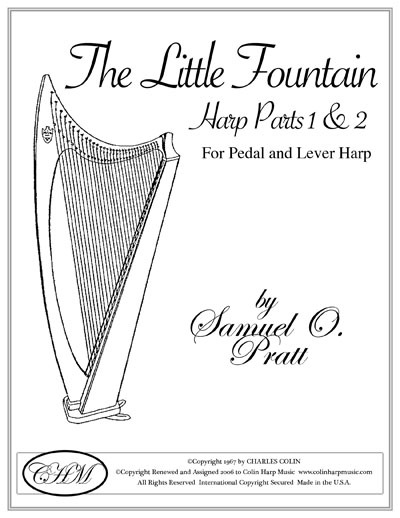 THE LITTLE FOUNTAIN HARP PARTS 1 & 2 FOR LEVER AND PEDAL HARP Fountains and brooks have formed the backbone of harp literature since the advent of the double action harp. This Little Fountain was composed especially so that the Troubadour Harp could participate in the joys of running water. It is not too difficult, but still may offer a challenge to the young or neophyte harpist. The two hands have the same chordal positions most of the time. The lyrical middle section should not be too fast., and the glissandos at the end are accomplished in a novel method of damping the Bb string and the A string, which, with the E lever turned up into the sharp position, produces almost three octaves of true glissando chords. The dampened strings are held by the left thumb and fourth finger, while the right hand glides over the indicated strings. It is a most effective piece and will be found highly useful as a part of the Troubadour Harp repertoire.